Commuters board a Regio train at a railway station in Berlin. When the discussion turns to the rising costs of living in many global cities, one factor rarely goes unmentioned: public transport fees. New Yorkers only spend about $116.50 per month on average, compared with up to $200 in London. Many Germans, however, might soon have to spend a whooping $0. The country of parental leave, short work weeks and Lederhosen may soon embark on a bold, new experiment: making public transport free. For a start, residents of five middle-sized cities are expected to benefit from the scheme this year, but it could eventually result in the end of bus or subway tickets across the country. The plans are included in a letter the German government sent to European Union officials, and was obtained by a number of news agencies and media outlets. So far, experiments with free public transport have usually been short-lived. When Paris was plagued by thick smog in 2014, authorities responded with an unprecedented idea – banning half of all cars and making public transport free. But the measures only lasted one week. Limited experiments with free public transport were eventually also stopped in Portland and Seattle. Germany’s latest, and more radical plans are similarly supposed to solve the lingering problem of air pollution in German cities, which recently prompted the threat of major EU fines. More than 130 cities in Europe are currently affected by “life-threatening” air pollution, according to the European Commission. They are believed to be responsible for about 400,000 deaths each year in the European Union. And even though Germany is far from being Europe’s most polluted nation, the topic is taken more seriously here than in most other places which have repeatedly breached EU limits on nitrogen dioxide and fine particles. In Germany, the topic also gained renewed attention after the Volkswagen emissions cheating scandal became public in 2015, which implicated the car manufacturer in having engaged in a deliberate effort to make its products appear more environmentally friendly than they were. In Germany’s capital Berlin, where standard monthly public transport tickets now carry the name “eco-ticket,” those revelations have triggered an unprecedented willingness to confront the country’s powerful car lobby. 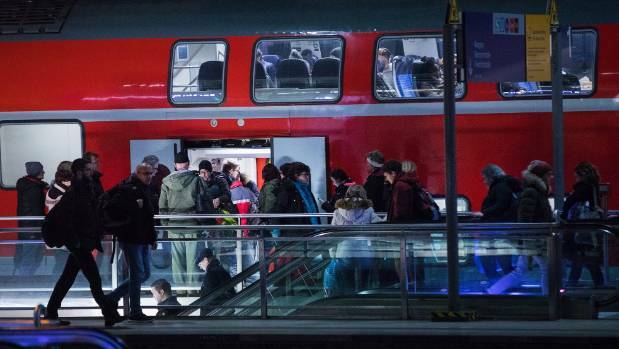 “We are considering public transport free of charge in order to reduce the number of private cars,” three German government ministers wrote in their recent letter to the EU, according to AFP. Those plans would be costly, as many German transport companies currently finance about 50 percent or more of their earnings through ticket sales. Instead, under the new scheme, the government would be expected to jump in to shoulder the burden, which would ultimately make public transport an almost fully tax-funded system. In Germany – a nation where cars drive on autobahns without a speed limit – the move might convince many vehicle owners to take the subway instead, the government hopes. But it could also overburden public transport networks in major cities such as Berlin, Hamburg or Munich that are already bustling during rush hours. The plans, some fear, would result in an exponential rise in associated costs because of costly network expansions. And would money alone be sufficient to get Germany’s public transport ready for the possible influx? Berlin’s new airport, for example, was supposed to open six years ago. It’s now set to welcome air travellers by 2020. The never-ending saga of the airport continues to highlight the country’s struggle with large-scale infrastructure projects – or perhaps this is all part of an ingenious plot to force Germans to book environmentally-friendly trains instead of polluting planes. This year saw multiple transport milestones: from the world’s first electronic freight trucks, to fully solar-powered trains, to landmark decisions to ban the sale of purely diesel and petrol-powered cars across the world. Could this year mark the point when the transport sector truly charts a course for sustainability? Here are the top five transport stories in 2017. In a move that was heralded as a tipping point for the global automotive industry, China in September said it is working on a plan to end the manufacture and sale of fossil-fuel powered cars. The country, which is the world’s largest car market, did not announce a fixed timeline for this goal. Other countries which made similar commitments this year include the United Kingdom and France, which plan to end the sale of petrol and diesel cars by 2040, and India, which announced a goal to sell only electric cars by 2030. This was a plan that some saw as ambitious, and others as unviable. Sweden-based, Chinese-owned industry giant Volvo also announced that it will make only electric and hybrid cars from 2019 onwards, becoming the world’s first major car maker to abandon pure internal combustion engine cars. Traditional models of bicycle-sharing in cities where users can rent a bike from one location and return it at another station have been around for a while, but 2017 was arguably the year of dockless bicycle sharing. Chinese companies such as Mobike, Ofo, oBike and ReddyGo expanded exponentially, in China and cities worldwide. Ofo for instance placed 100 bikes on the streets of Oxford, UK, and said it plans to have 20 million bikes on the road across 200 cities by the end of this year. Competitor firm Mobike also launched 1,000 bright orange bikes in Manchester. In Australia, China-backed ReddyGo in June brought “thousands” of bikes to Sydney, while oBike debuted in Melbourne. Many acknowledge the schemes as an effective means of reducing air pollution and traffic congestion—especially in China’s notoriously smoggy cities—but the rapid proliferation of bike-sharing has created a situation where supply vastly exceeds demand, and users have abused the dockless model to indiscriminately dump bikes in public places. The company widely regarded as a leader in electric car innovation unveiled the Tesla Semi Truck in November, opening up the potential to electrify the global freight vehicle market. Available in models with a range of 300 and 500 miles, the trucks will be available for purchase in 2019. Companies such as package delivery firm UPS, US retail giant Walmart, food firm Pepisco have collectively pre-ordered more than 200 models. Australia’s Byron Bay Railroad Company unveiled the world’s first fully electric, solar-powered train in December. The 100-seater train, which plies a three-kilometre round route in the northern New South Wales district, has a 6.5 kilowatt (kW) solar panel array on the train roof, and is fitted with a 77 kilowatt-hour (kWh) battery storage system. This is enough storage for between 12 and 15 trips, according to reports. Brian Flannery, the multimillionaire businessman who funded the solar train, noted that a train plying a longer route would need recharging stations along the way, and added that the technology might be well suited for use in inner city trams. Meanwhile India, home to Asia’s largest rail network, in July unveiled its first solar powered train. These trains still use diesel to move, but all air conditioning, lighting, and information displays on board are solar powered. Indian Railways estimates that using solar on board the 11,000 trains it operates daily could save the company US$6.31 billion over the next 10 years. Though not a new technology, the concept of building roads using plastic waste gained mainstream popularity this year. Indonesia, which is among the top five plastic polluting countries in the world, tested out the practice of mixing shredded, melted plastic waste with tar to make more durable, cheaper, and stronger roads this year. The initial test along a 700-metre stretch of road was carried out at a university in Bali, and officials plan to expand the solution to major cities such as Jakarta and Surabaya soon. Analysts also urged India, where at least 15,000 deaths were caused by potholes in 2016, to make more roads using plastic. Though the Indian government made it mandatory to incorporate waste in highways in 2015, some states have been slow to adopt the practice. The plastic road movement also caught on the United Kingdom this year, when engineer Toby McCartney and his start-up MacRebur persuaded two English councils to use waste to build their roads in April. Developing transport in China is part of the goals mentioned in a key report delivered at the 19th Communist Party of China (CPC) National Congress in October, putting it high on the government agenda. Wu emphasized many key aspects of China’s transport vision, including the importance of the environment, personal safety and being people-focused. China’s transport industry has seen rapid development, with 1.28 million km of rural roads built or renovated in the last five years, and over 99 percent of townships and over 98 percent of villages now connected by asphalt or cement roads. Total road mileage has increased by 534,000 km, railways in operation grew by 27,000 km, and over 7 billion trips have been made on high speed railways from 2012 to 2017. “By building a global transport supply chain that connects the urban and rural areas in the country and links China with the world, the transportation industry can play an important role in China’s goal to realize socialist modernization,” Wu said. China is already a world leader in technologies such as high-speed railways. Besides an increasingly intricate domestic high-speed railway network, China is also helping other countries with transport infrastructure construction. Chinese companies are carrying out more than 20 railway projects overseas, with a total investment of 100 billion yuan (about 15 billion U.S. dollars), China’s railway authorities said in November. The corporate burden has been reduced significantly in China, with the country cutting logistics costs by more than 88 billion yuan (13.4 billion U.S. dollars) in 2017, through measures such as the removal of a number of road tolls and the introduction of streamlined traffic services. According to Zhang Dawei, a transport ministry official, China plans to cut more logistics costs in 2018 through measures including streamlining charges at ports. “The country will continue to push supply-side structural reform in the transport realm, improving weak links through reasonable and effective investments,” Zhang said. In 2018, China plans to build 5,000 km of expressways, build and renovate about 200,000 km of rural roads and increase inland waterways by over 600 km. Wu said that China intended to pilot a project on green cargo delivery next year, encouraging the use of clean energy-powered trucks and Internet-based information sharing systems. So much for all that stuff about rebuilding the infrastructure. The Trump administration blocked an Obama-era agreement with New York and New Jersey that would have seen the federal government funding half of a $13 billion New York City-area Amtrak renewal project. The plan was to have rebuilt a tunnel that brings 600,000 commuters to the city from New Jersey each day. Trump is expected to introduce his own infrastructure plan in 2018. Swiss engineering and technology have reached new heights with the opening of the world’s steepest funicular rail line. The €44.6m Schwyz-Stoos funicular (Standseilbahn Schwyz-Stoos in German), which goes into public service on Sunday, has been hailed as a triumph of modern design engineering. A level-adjusting function will allow the space-age-looking carriages, accessible to all users, to remain horizontal while speeding up the mountain at up to 10 metres a second. It is due to be opened on Friday by the president of the Swiss federal council, Doris Leuthard, in the Alpine resort of Stoos, 1,300 metres (4,300ft) above sea level in central Switzerland. The train, two lines of cylindrical carriages, resembling beer barrels, will allow passengers to remain upright at all times, even as they ascend – or descend – the 1,720-metre track, climbing or descending 743 metres along gradients as steep as 110% (47.7º). It will run from the valley station near Schwyz into the mountain village of Stoos, population 100, about 30 miles (50km) south of Zurich. Ivan Steiner, a spokesman for the railway, said the funicular replaced an older one that had operated since 1933. “After 14 years of planning and building, everyone is very proud of this train,” he said. The Gondola Project, a website dedicated to cable-propelled transport systems, said the scheme had faced a number of challenges even before work had begun. Then when construction started in July 2013, it faced hold-ups. “Designers analysed 15 different options before selecting the existing route alignment and technology,” it wrote. A traditional aerial gondola funicular was ruled out because it would have had to pass through an active shooting range. The Gelmerbahn funicular at Bern was previously the world’s steepest, with a maximum gradient of 106%. The East Cliff Lift funicular railway in Hastings, built in 1902, is the steepest in England, with a gradient of 78%. 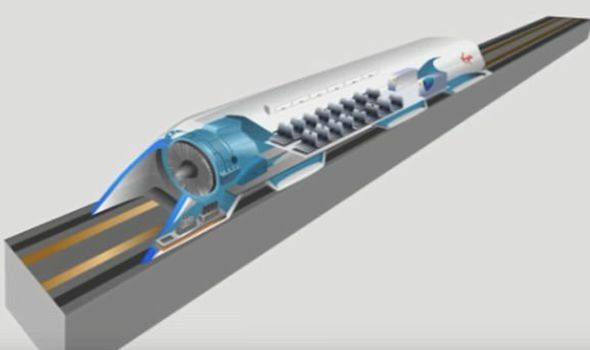 The state-owned China Aerospace Science and Technology Corporation (CASC) is developing the innovative trains, which are 10 times faster than the world’s fastest bullet trains.Scientists have said the new trains will rival the new Hyperloop system being built by the billionaire Elon Musk. Deputy general manager at CASC, Liu Shiquan, said their scientists would be developing the very fast trains of the future that are able to “fly on the ground”. 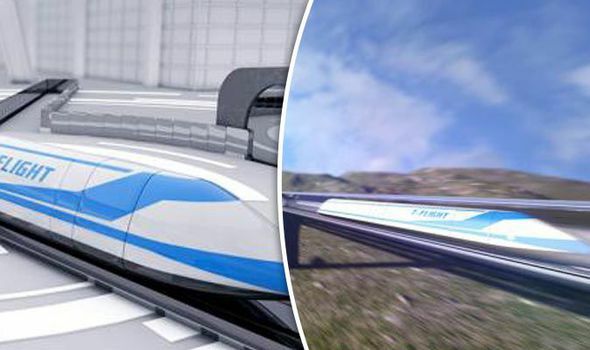 These ‘flying trains’ would allow passengers to travel from Beijing to Wuhan in central China in half an hour, according to the Chinese aerospace company.The journey currently takes five hours by train and is around 720 miles in distance. China’s state-owned website The Paper said: “The corporation has built rich experience and accumulated technological know-how through major projects, and it has the capabilities in simulation, modelling and experimentation for large-scale projects, as well as the world-class design capability for supersonic aircraft, all of which lay the important ground for the super-fast train project.”China already has the most high speed trains in the world and CASC have said they will work with other researchers to create the new high speed trains. Mao Kai, chief designer of the system, said in an interview with a state newspaper the train will ensure safety by allowing for acceleration that is slower than that of civil aircraft. If the company does succeed in developing these ‘flying trains’, they would be travelling at speeds that are four times faster than commercial flights and more than three times the speed of sound.The contractors have said they would transport the supersonic train to more than 60 countries across Asia, the Middle East, Europe and Africa. The top speed recorded by the Concorde jet before it was deemed too unsafe in 2003 was 1,354 mph. However, critics of the project have said the human body would not be able to withstand such an intense acceleration for very long. Elon Musk’s Hyperloop could take passengers from London to Edinburgh in half an hour, a journey that currently takes more than four hours. 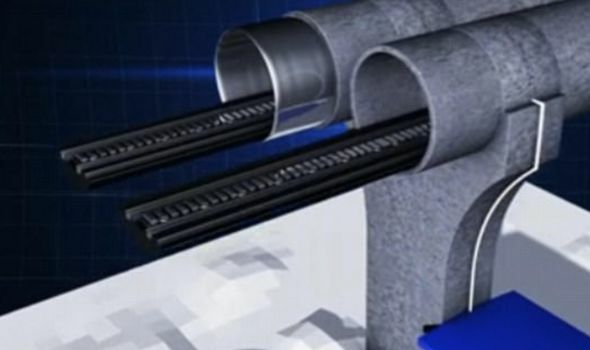 The developer has described the transport system as a “cross between a Concorde, a railgun and an air hockey table”. The Hyperloop would allow passengers to travel in pods inside hide tubes. Removing all of the friction from the technology would mean that the Hyperloop could carry passengers at around 760 mph. BEIJING: Breathtaking scenery and breathtaking dangers – both will face Chinese engineers as they embark on building the world’s most difficult railway. The Sichuan-Tibet Railway will be the second railway into Tibet region after the Qinghai-Tibet Railway. The railway line will go through the southeast of the Qinghai-Tibet Plateau, one of the world’s most geologically active areas, Xinhua news agency reported. “The construction and operation of the Sichuan-Tibet Railway must overcome the biggest risks in the world,” said You Yong, chief engineer of the Institute of Mountain Hazards and Environment of the Chinese Academy of Sciences (CAS) who leads a scientific and technological support team to avoid disasters in the mountains. The China Railway Eryuan Engineering Group Co Ltd, which is designing the line, said it will run from Chengdu, capital of Sichuan province, and enter Tibet via Qamdo. It will reach Lhasa, capital of Tibet. The total construction length will be about 1,700 km and it will cost about $36.88 billion. 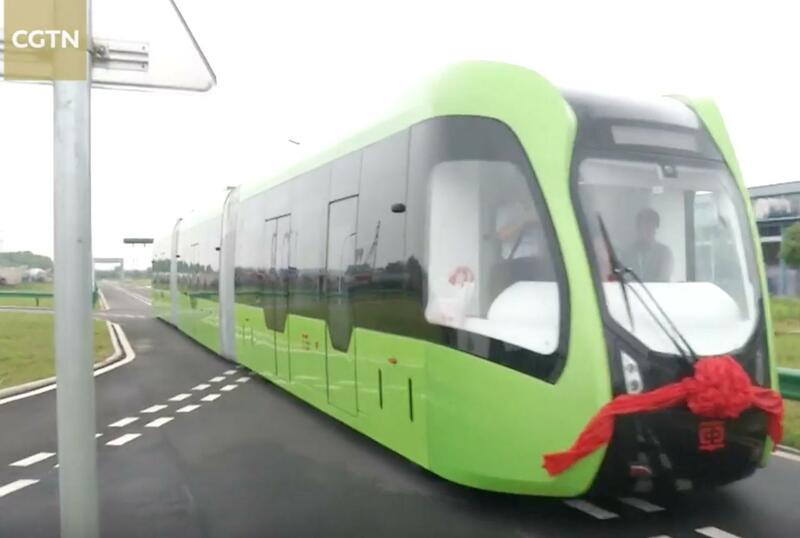 The Autonomous Rapid Transit (Art), which was unveiled in the city of Zhuzhou on 2 June, is around 30 metres long and is fitted with sensors that detect the dimensions of the road. 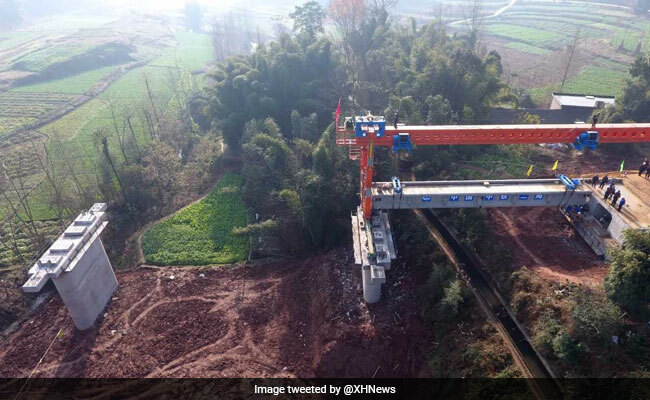 This enables the vehicle to follow routes without the need for metal rails, Feng Jianghua, a chief engineer behind the project, said according to Xinhaunet.net. The firm, which has been working on Art since 2013, hopes to roll out the train in 2018. Instead of having steel wheels like a train, Art is fitted with rubber wheels attached to a plastic core which are linked to its especially designed guiding technology, The Paper.Cn reported. Its creators say that Art is significantly cheaper than a metro service, which costs between 400 to 700millon yuan (£46 to £80million) per km to build. In contrast, Art costs between 15million yuan (£2million). BEIJING: China will pump in $ 117 billion for the second consecutive year to add 35 new projects to the world’s second-largest railway network as it aims to halt the slowdown of the economy through massive state investments. Construction of 35 new railway projects will begin in 2017 to expand the network, state-run Xinhua news agency reported. The report cited unnamed officials as saying that construction will start on 2,100 km of new rail lines, 2,500 km of double-trac ..